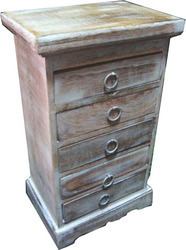 Our vast industry experience and competent workforce enables us to offer a broad array of Wooden Jewelry Box. These are widely demanded by the clients for keeping the jewelry items. Available in various colours and designs, we offer these Wooden Jewelry Box at reasonable prices to our precious customers. Its a very good looking jewellery box which is very well finished and it have four small drawer and one box from up side. their is work of brass on wood which makes it beautiful and its a usable item. 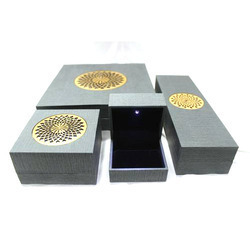 Jewellery Boxes, Trays and Drawers of different designs in good quality. In order to attain maximum client satisfaction, we are instrumental in providing a range of Wooden Jewel Box to our clients. These Wooden Jewel Boxes are procured from certified vendors of the market who use best quality wood to made these products. Additionally, we offer these products as per the client’s requirements.